It’s heeere! Reveal day! 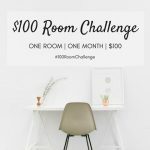 For those just joining in, during the month of March, myself, along with a couple dozen other bloggers, took on one room in our homes and gave it a makeover… with $100. 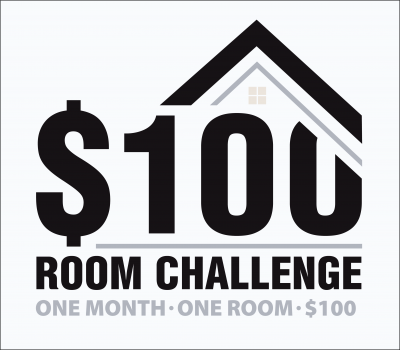 (You can read more about the $100 Room Challenge here.) I decided to work on our master bathroom and it looks nothing like it did a few weeks ago. I can’t wait to show you!!! 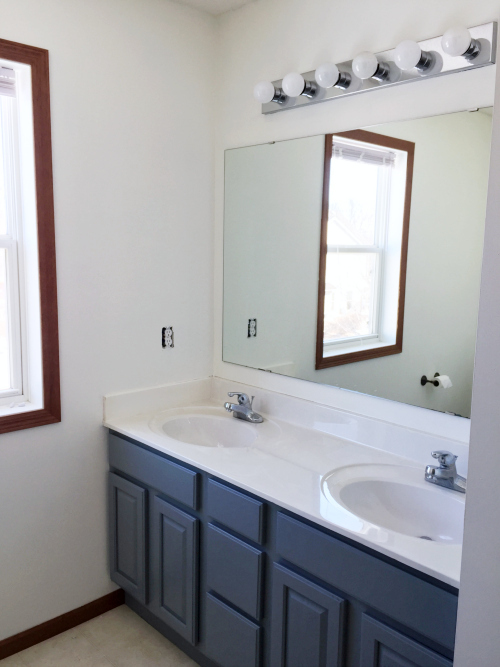 This bathroom was builder-grade beige and boring. Let’s see how we got to this point… and there’s a whole lot more before and afters to see as we go. I know most pictures read the vanity color as more blue, but this one shows you how gray it appears. Maybe it’s bluer on bright, sunny days and gray-er on cloudy days? I’m not sure. This was a project that was completed this week. We had to keep on budget, so we shopped the “leftovers” at our local hardware store. 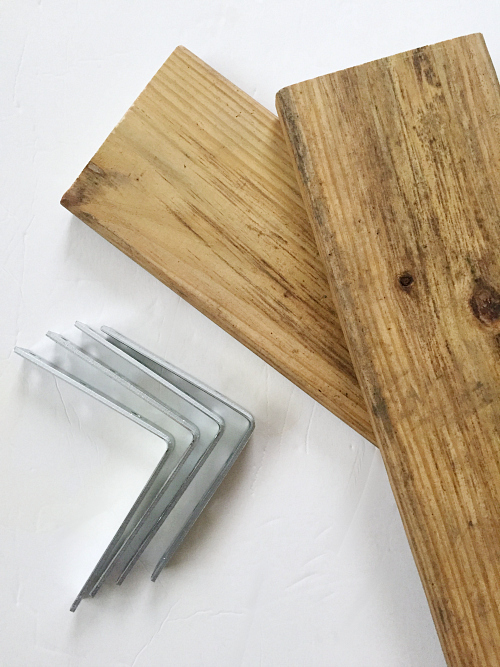 We got 2 pieces of wood for $1.90 (Yep. Ninety-five cents each.) Then, instead of buying shelf brackets, we bought corner braces and spray painted them with Oil Rubbed Bronze spray paint. Using some drywall anchors, we screwed the braces into the wall and wood (after staining); and we had ourselves two shelves. Total cost for both shelves? $10.50. 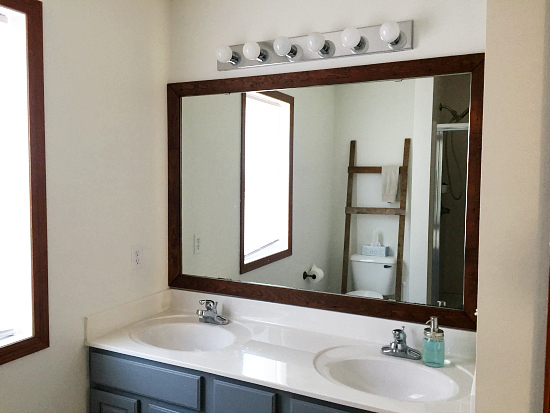 Our poor mirror was so plain, so last week, my husband created a frame out of barnwood, and we got it installed. Love how it turned out! I started out with the idea of framing some free botanical printables I found on Pinterest, but whevn they printed, the coloring was really weird, and I was not loving them. 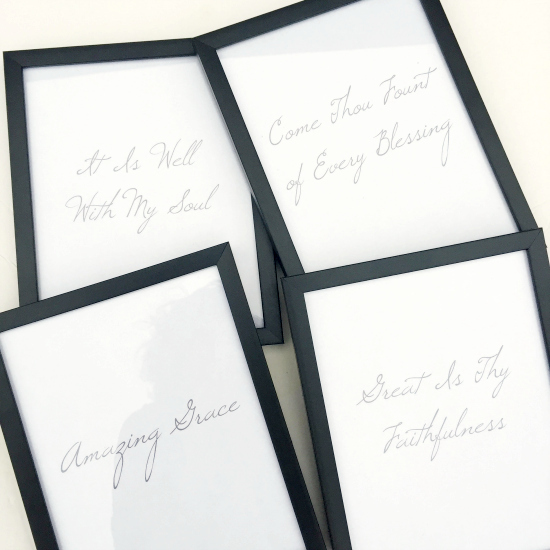 I decided to keep searching my Pinterest Printables Board and found a few hymn lyrics that I liked; but when printed, they didn’t look cohesive. Time to try something on my own. I played around in PicMonkey, and found a font that was perfect. I ended up going simple, and I love them. The only thing that didn’t get done was the addition of a towel hook under the shelves. I actually have everything I need to make it (a pallet I got free from a Facebook group and a hook I removed from our cleaning closet makeover), but time just didn’t allow for it. Wood Piece x2- $1.90 (95¢ each) Found these in the “leftover pile”, so they were deeply discounted. Just a little over budget. Make sure to check out all the reveals using the link-up below! And if you want to win $100 to try your hand at this challenge (or to buy a new pair of shoes 🙂 ), pop on over to my Instagram account and enter the $100 giveaway. 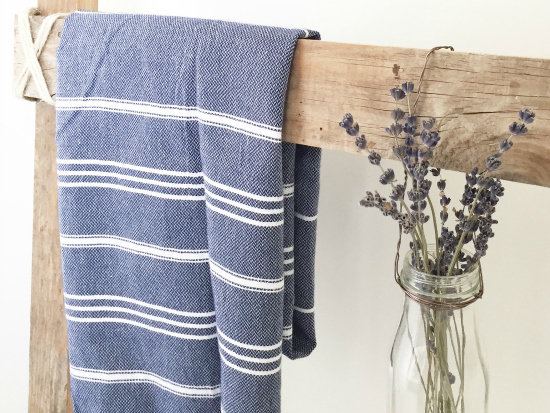 Today on Rachael R so , you showed your Laundry Room shelves makeover. Is that somewhere on your blog site? Please help me find it. Looked so nice. Thanks. You are very creative. Sept. 11, 2017. I was watching Twin Cities Live the other day and Elizabeth (cohost) had her mother on the show. Her mother has invented “Paint Behind” a tool for painting behind small spaces, such as behind the toilet. The u-tube video looks like it would work really well. I just watched the YouTube video. What a clever idea! We have now redone 3 out of the 4 bathrooms in our house, but I’m gonna have to get one when we finally get to that last bathroom. Thanks for sharing! 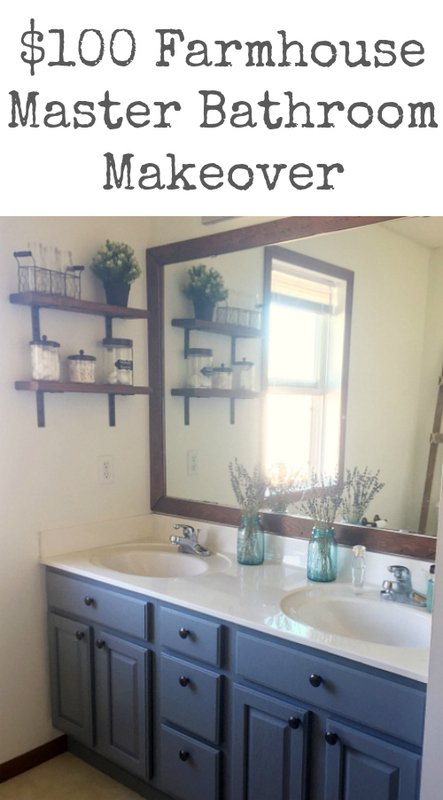 Erin, your bathroom makeover looks wonderful! You did so much on so little money. I don’t know if you made any changes to your above-sink light fixture. We have a light fixture like yours and we took it down, spray painted with oil rubbed bronze, and it fits right in with the new decor. Spray painting the light fixture was on our list of things to do, however, my husband’s grandmother passed away this month, so a couple things just didn’t get completed. I still plan on doing that though. I’m so happy to hear you’ve tried it and saw such a difference. Maybe we can shoot for that this weekend when it’s supposed to be warm and sunny (perfect spray painting weather). Oh my, this is like night and day. I really like what you did with this space. It looks brand new! Thanks Jessica! I really did change a ton over this month. It’s the mark of a church musician that I started humming each of those hymns! HA! 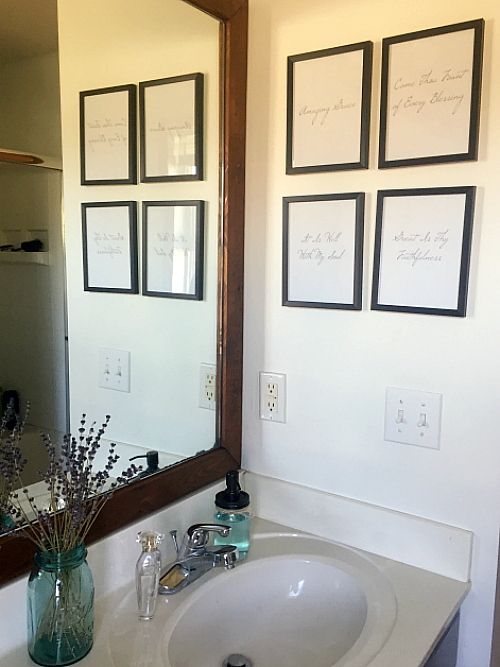 I love how your bathroom turned out, particularly the frame on the mirror. It looks completely different and so much classier. Gorgeous! Thanks for hosting the challenge! It’s gorgeous Erin!!! I love the rustic look ladder and the shelving. You did a beautiful job. What an improvement, Erin! 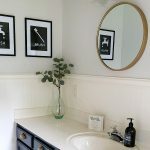 Your bathroom has so much personality now! I love all the rustic elements you added, too! It’s so pretty Erin! 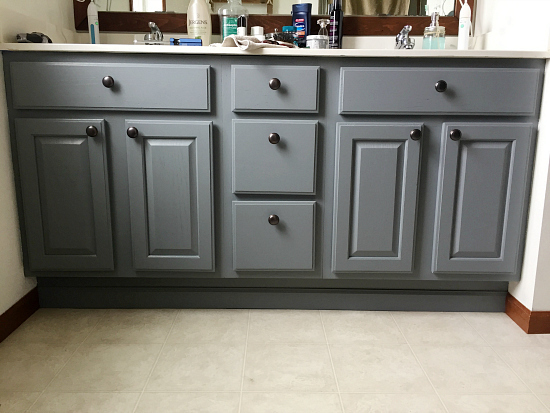 I love how it turned out… you’re right though I did think the vanity was a blue before you pointed out it was gray! Turns out you’re the one with the “bluish” furniture! 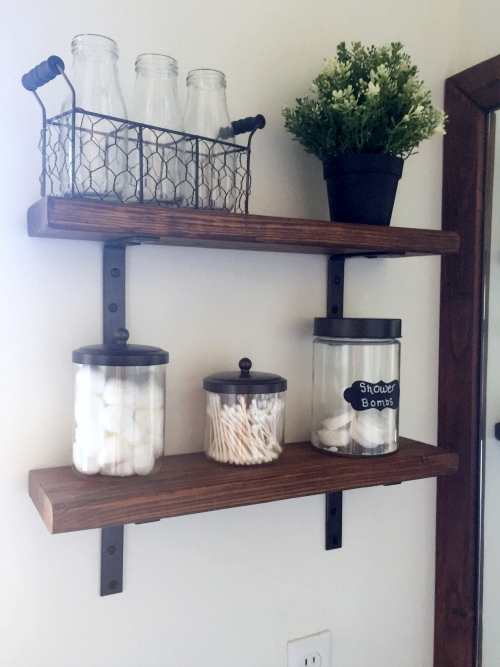 I think my favorite piece is your shelves though… that little bit of oil rubbed bronze made them look amazing! Thanks Betsy! I actually think the lighting changes the color of the vanity. If it’s bright outside, they look more blue. Cloudy, they’re more gray… Definitely blue and not blush 🙂 I am loving those shelves as well. That wall really needed a little something, and the shelves were a perfect addition. Excellent! You had a vision, followed it through and now have an absolutely lovely space. 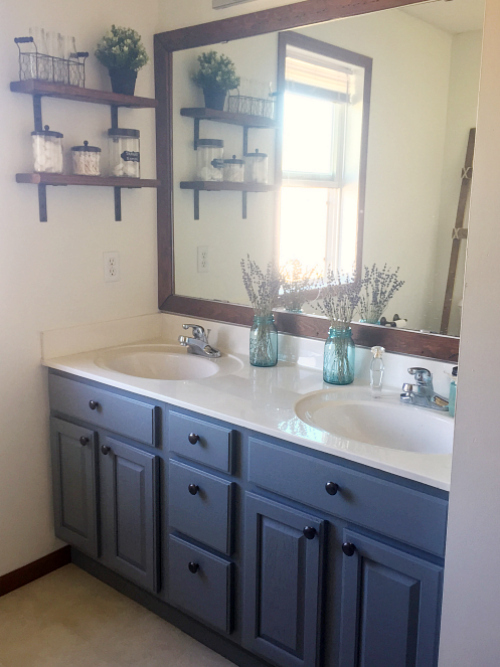 I love the color on the vanity! Also that ladder is great. Thanks so much for hosting! Thanks Jess! I absolutely LOVE hosting this challenge. So many ideas and so much talent! Erin fantastic makeover! 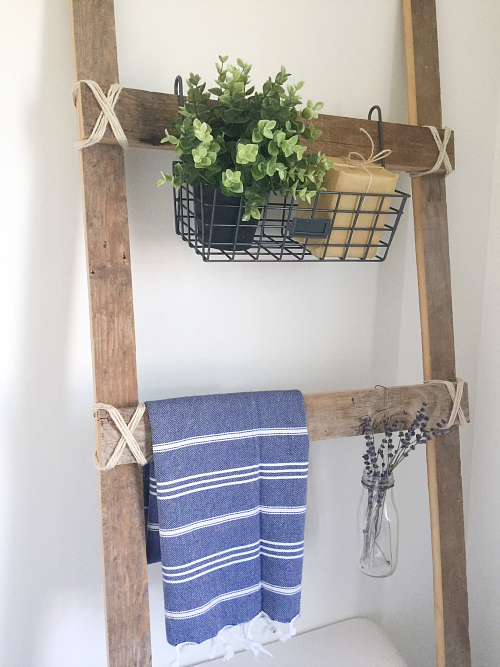 I really like how you styled the rustic ladder. Those hymn verses are also awesome! 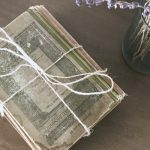 Thank you so much for hosting this challenge! It was so fun and can’t wait to do it again. Thank you so much Linda! 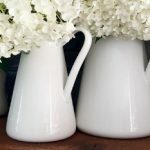 It is such a pleasure to host this challenge with so many talented bloggers! LOVE THIS! 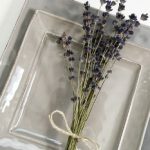 Such a great way to modernize the space!! Erin, it’s amazing! you must be a happy girl each time you enter this bathroom! 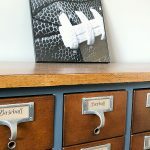 We think alike cause I was sooooo looking for a little basket for the top of my ladder but couldn’t find one with the right dimensions and that fitted in my budget! Thanks for making this amazing challenge happen! That basket was SO hard to find. You’d think they’d be everywhere, but nope. I searched every aisle of Hobby Lobby and Target. I looked online at both IKEA and Amazon. Finally found what I needed at World Market, but it was not easy. Also, my pleasure hosting this fun challenge. Love seeing what everyone came up with for their rooms! 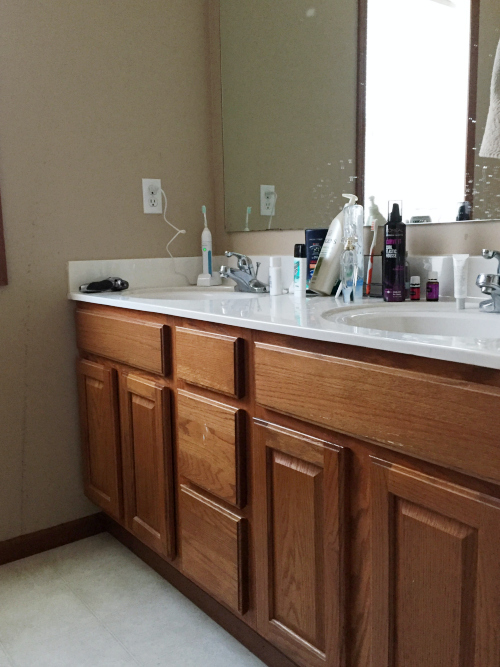 Erin, your bathroom looks fantastic! The prints of the hymns are perfect. What font did you use? Looking forward to participating next round! 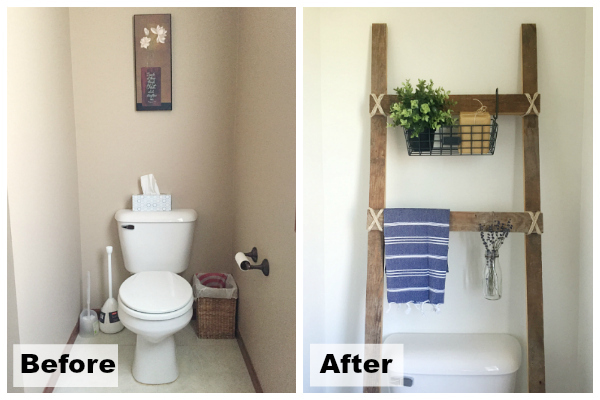 I’m in LOVE with that farmhouse ladder shelving above the toilet. It’s amazing!!! 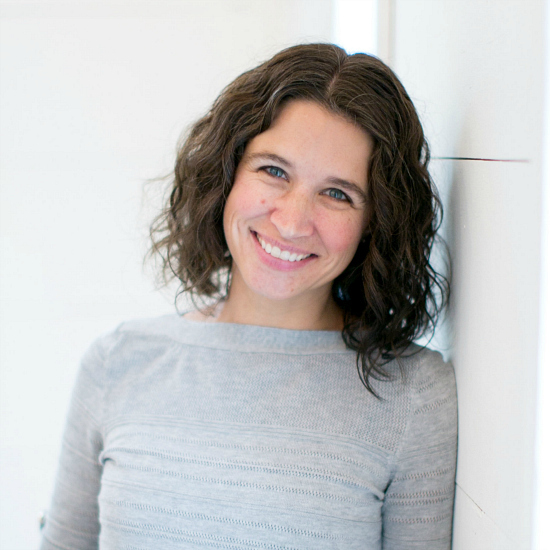 You did such a great job Erin, and thank you so much for hosting this fun challenge. I’m so happy to have participated this past month and have been so inspired by your amazing room transformation. This is an awesome transformation. I think the ladder is my favorite, and the way you styled it is soo cute! Thank you Nicki! 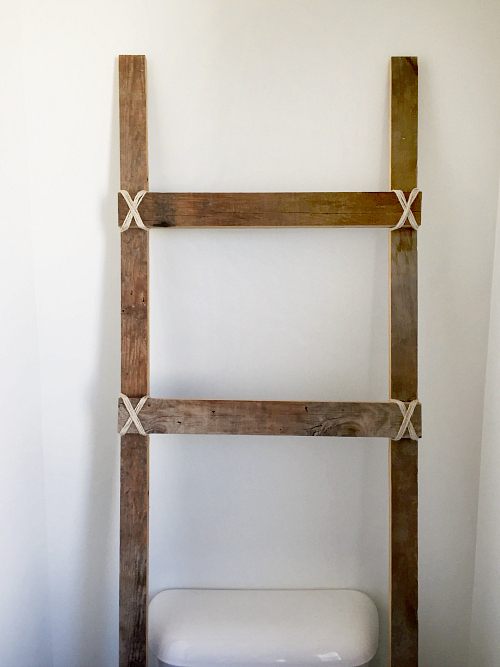 I love that ladder too, and it was such a simple little project 🙂 Love when simple makes a big difference. Amazing what a little paint can do! It looks amazing. I love, love, love this! What a terrific makeover! Congratulations! Thank you so much Claudine! Thanks Liz! I’m so glad you were able to participate in the challenge. So fun to see what everyone decided to do with their space. Looks awesome Erin! 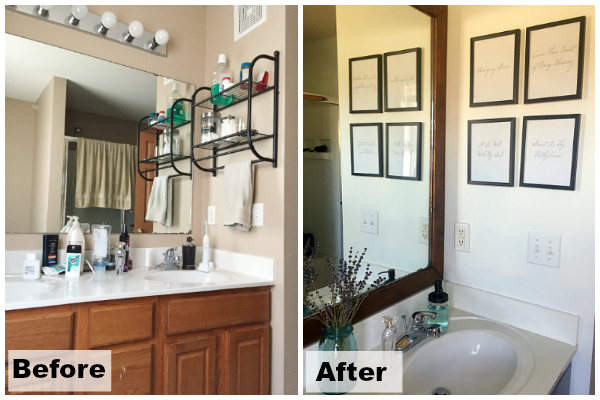 The framed mirror makes such a difference, too. I can’t wait to frame ours! Thanks Brittany! I love how much that wood frame changed the whole look of that poor mirror. I cant believe you love painting furniture! It’s my least favorite part, but it does make a huge impact. I love how it turned out. Thanks for a fun challenge! I love it Erin! The color of the vanity is absolutely perfect! so pretty! This is gorgeous and inspires me to paint my bathroom cabinets, too. Also, you picked one of my top two fave hymns (“Come Thou Fount of Every Blessing”). My other is “Be Still, My Soul.” Thank you so much for sharing! Thank you Lisa! I love old hymns. Their lyrics are so perfect, and great reminders while getting ready for the day. 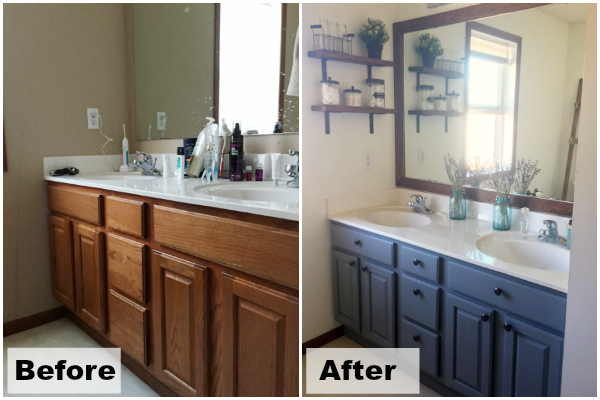 Erin, This is a fabulous makeover and your bath is gorgeous! I love so many things but my favorite is the hymn prints! I love old hymns and I am going to have to copy this for my home. Thank you so much for putting this challenge together and including me. I had so much fun. I absolutely love old hymns. Their lyrics are just amazing! I am so glad you joined the challenge. I love seeing what everyone came up with for their spaces!